Men’s Pull And Bear Denim Jacket Size M. Has cotton jersey material arms and hood in a camouflage pattern. Condition is Used. Chaqueta de Cuero Ante. Composición: Cuero. Estado: Usada. Falta el último botón. Lote de dos chaquetas vaqueras - una de chico y otra de chica ( pull & bear ) talla L las dos. Preciosa chaqueta cazadora de caballero de cuadros con cierre cremallera y 5 bolsillos esteriores 4 de ellos con cremallera y uno de ellos con solapa don belcro y 2 interiores con cremallera, de abrigo de la firma XOYE ORIGINAL FABRICADO POR PULL&BEAR ESPAÑA S.A.
Abrigo paño de Pull and Bear talla L, aunque es pequeño,mas bien una M.Poco uso. Talla L,aunque es mas bien una M.Está impecable,poco uso. Pouch pocket jacket with a drawstring hood, a zip to the chest and an elastic hem. Filling: 100% Polyester, Lining: 100% Nylon, Outer: 100% Nylon. Drawstring hood. It's what's on the inside that counts. Se vende porque la talla es pequeña. Pull&Bear jacket. Sleeve 66cm 26" (from shoulder to end of sleeve). Shoulder 44cm 17". H as zip fastening, 2 pockets, lining, elastic cuffs, decorative zip around collar, patterned shoulder and sleeve panels. Faux leather bomber jacket by Pull & Bear. Exceptionally good faux leather - heavyweight and structured. U.K. men’s size medium. VERY slim fitting so perhaps fits better as a small. Used but in excellent condition. I’ve listed as new without tags as I’ve only worn it once. It’s an XL, which will fit a large if you are wearing a jumper underneath. I found the L too small. Non smoking, pet free home. In very good used condition. Length: 66cm. Rear shoulder seam to shoulder seam: 18". Exact sizing is as follows. Width at widest point (armpit to armpit): 22". DESIGNER | STILISTA : PULL & BEAR. COLOR | COLORE : BLU. CIRCONFERENZA BACINO 94. LUNGHEZZA TOTALE 66. LUNGHEZZA MANICA. WAIST CIRCUMFERENCE 94. TOTAL LENGTH 66. Mens Pull&bear Jacket Size Large. Condition is Used. Only worn once . 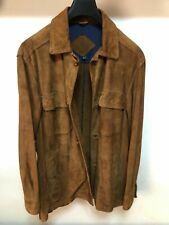 Beige suede effect fabric lovely jacket. Cotton Duffle Coat. Pull & Bear. Hardly Worn So Excellent Condition. Khaki Pull & Bear lightweight coat with hood, worn only once. Zipped chest pocket and zipped side pockets, also an inside pocket. Toggles to tighten around the bottom and the hood. Pull & Bear Men faux suede bomber jacket Tan Size Medium. Chest size 38. Soft and light weight. Only defect is inside jacket, can see in the last picture. Mens Pull & Bear Jacket Size Small New Red Lightweight Summer Coat With Tags. Condition is New with tags. Dispatched with eBay delivery – Shutl 1 day. DESIGNER | STILISTA : PULL & BEAR. MATERIAL | MATERIALE : 100% COTONE. CIRCONFERENZA BACINO 110. LUNGHEZZA TOTALE 68. LUNGHEZZA MANICA 68. Two front pockets on outside. Excellent condition. Style: basic jacket. Type: Jacket. Top Quality. 30 moneyback warranty. Size and fit are approximations and may vary across designers. 3XL 60 30 118 50R XXL. 3XL 58 29 114 48R XL. XXL 56 28 110 46R XL. Taillenweite: 54 cm. Zustand: sehr gut. For easy translations you can always use the Google translator. Men's Bomber Jacket Pull And Bear Navy Medium. Condition is Used. Dispatched with Royal Mail Signed For® 2nd Class. This khaki parka from Pull & Bear is brand new with tags and has a zip fastening, detachable faux fur trim on the hood and Borg half lining. It is a size medium and measures 23 inches from armpit to armpit across the back and is it 32 inches long from the nape of the neck to the hem. SIZES DO DIFFER SO PLEASE CHECK OUT THE EXACT MEASUREMENTS IN THE DESCRIPTION. THANK YOU I am selling loads of lovely new and nearly new items so please take a look at my other listings as I can offer postage discounts for multiple purchases. DESIGNER | STILISTA : PULL & BEAR. CIRCONFERENZA BACINO 88. LUNGHEZZA TOTALE 72. LUNGHEZZA MANICA 68. Cool Polyskin Shell, Inside: 100% Poly. Colour & Details : Long Sleeved Black Background Jacket With A Hood. Hoodie Has Green & Colours Jungle Floral Decoration. Has 2 Side Pockets With Zip Fastenings. Hood Has Drawstring To Tighten. Drawstring To Waist To Tighten. Pull & Bear leather logo sewn in at the back (inner side). This lightweight casual leather jacket is perfect to wear in various weather conditions, particularly spring & autumn season. Bright colour easily matches other clothes and does not stand out too much. Born in the 90s, Pull&Bear aren’t ones to suffer stereotypes. Sweatshirts, T-shirts and jeans make up their core collection alongside a sharper line of accessories, indigo denim and biker jackets. Lined with internal pocket. Pull & Bear Long Rubberised Parka Small.